An eau de parfum, a mini eau de parfum, a body lotion and a shower gel. Dive into an enchanting love story this Valentine's day, filled with an explosion of the most luxurious and alluring flowers. Shaped in a heart, this Flowerbomb 4-Piece Heart Set opens to reveal a 1.7 fl. Oz. 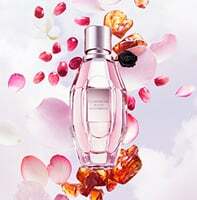 eau de parfum spray, a 1.7 fl. oz. showel gel, a 1.3 fl. oz. body cream and a .24 fl.oz. mini. Flowerbomb 4-Piece Heart Set is rated 5.0 out of 5 by 1.